Freemasonry's relationship with the Boy Scouts started with a Freemason named Daniel Carter Beard. Beard was made a Mason in Mariner's Lodge No. 67, New York City, NY, and later affiliated with Cornucopia Lodge 563, Flushing, NY. In the late 1800's he founded a male youth program called the "Society of the Sons of Daniel Boone." By 1905, the program had become "The Boy Pioneers." The man who would create the first "Boy Scouts," and be known as its founder, was Lord Robert Baden-Powell of Great Britain. Lord Baden-Powell, who was not a Mason, read of Beard's program, and based on his own military experience, developed what is known as the "Boy Scouts." 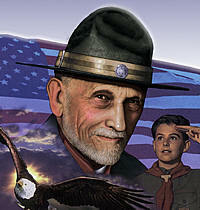 In 1910, the Boy Scout program came to America when Beard merged his organization into the "Boy Scouts of America" and became its first National Commissioner. Beard, known affectionately as "Uncle Dan" by millions of Boy Scouts, worked tirelessly to create the Scouting Program that exists today. He developed the elements of the Scout badge and the Scout uniform, and wrote and illustrated various early publications of the Boy Scouts of America. Beard exemplified the Masonic ideals throughout the Scouting program. The Freemasons have long been a strong supporter of the Boy Scouts of America by supporting the development of Scouting units, serving as volunteers, and assisting their Masonic lodges in forming and sponsoring Scout units. The relationship between individual Masons and Scouting, which has existed since the founding of Scouting in America, has resulted in great benefits for both Freemasonry and Scouting. The Daniel Carter Beard Masonic Scouter Award is a Boy Scout Community Organization Award, used by community organizations to honor their volunteers for Scouting. Recipients are presented a medallion on a neck ribbon (shown below), and may wear the generic Boy Scout Community Organization Award Square Knot shown above. The nominee must be recommended by a Master Mason in good standing. The Official Nomination form (Petition) must be used. Step 1: The recommender must complete the petition and submit an attached page explaining the candidate's qualification for the award. Step 2: The recommender should also have the petition approved and verified by the local Council, indicating that the candidate is currently registered as an active Scout leader. Step 3: The recommender should then have the petition reviewed by the Worshipful Master of the candidate's lodge. If found to be qualified, the petition will be authorized and forwarded to the lodge's district deputy or other Masonic authority designated to handle the award in his home jurisdiction. That person will then submit the petition, as instructed by his Grand Lodge, for action. Step 4: The Grand Lodge of Pennsylvania will then forward the information on awardees to the Boy Scouts of America, Relationships Division, Irving, TX for the official record of recipients. The Daniel Carter Beard Scouter Award will be presented at the discretion of the Grand Master. It may be presented at a Grand Communication or other similar meeting where a representative of the Grand Lodge makes the presentation. Arrangements also can be made to make the presentation at a Lodge or Scouting-related function. In all cases, a representative of the Grand Lodge should present the award.